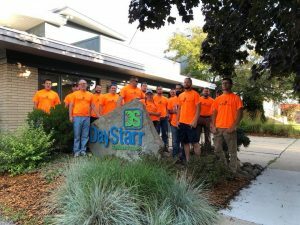 [12/03/2018] In August, the DayStarr Team participated in a day of giving back to serve our community. We schedule days of service about twice a year. We still attend to emergencies on these days, but our office is closed for regular business. You will see our staff around the community helping local businesses and non-profit organizations. This summer “Give Back” day included The Respite House in Owosso and The Child Advocacy Center. We assisted with yard work, painted, stained and made some necessary updates. “We set aside these days to stay involved in the community. They also serve as great team building experiences for our employees,” explained President, Collin Rose.